Gerald Brockhurst was an Engilsh painter and etcher. He entered the Birmingham School of Art at the age of twelve and soon showed uncanny drawing skills. He won the gold medal and scholarship at the Royal Academy Schools in 1913. He tried his hand at etching in 1914 but it was not until 1920 that he began his career as an etcher in earnest. 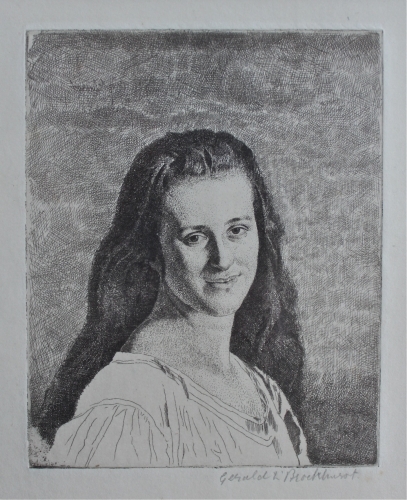 He used his first wife Anais as the model for most of his early etchings from 1920 - 1934. However, after falling in love with a sixteen year old model named Dorette and divorcing Anais, Brockhurst was forced to leave England due to negative public opinion. He settled in New York and became both famous and rich as a society portraitist but sadly his printmaking output diminished.